Up to 40% Off Plus Free Delivery on Selected Lines in the Outlet at Wayfair Discover the Outlet Deals at Wayfair and shop a range of furniture and home appliances with up to 40% off plus free delivery on selected lines! Over 60% Off In The Clearance Store At Wayfair - Dinnerware, Bedding And More! Snap up a bargain in the clearance store at Wayfair. Shop a range of dinnerware, bedding and much more! Enjoy 50% Off Lines in The Garden Shop at Wayfair - Shop Furniture, Heating & Lighting Head on over to Wayfair and discover The Garden Shop! Save 50% on a range of furniture, heating & lighting! Up to £50 Off Beds, Furniture, and Storage in the Daily Outlet Deals at Wayfair The outlet deals change daily, so be sure to jump on it if the furniture you've had your eye on crops up! Save 30% in the Home Decor Deals at Wayfair - Shop Cushions, Throws, Mirrors & Wall Art Add some personality to your home and shop the range of home furnishings at Wayfair. Discover £70 Off Kitchen & Tableware Orders this Spring at Wayfair From kettles to cookware sets, find everything you need in your kitchen at Wayfair! Up to £50 Off Garden Furniture at Wayfair - Including Seating, Chiminea's & Planters Get ready for spring and shop a range of garden furniture in the outdoor sale at Wayfair! Free Delivery on Orders Over £40 at Wayfair Qualify for free delivery at Wayfair when you spend over £40. £60 Off Selected Lighting at Wayfair - Save on Floor & Table Lamps, Outdoor Lighting & Much More Take advantage of the mid-season sale at Wayfair! Take up to £60 off selected lighting. Garden Dining Sets From £50 At Wayfair - Spring is Here Make the most of your garden this spring time and get a new garden dining set from just £50 at Wayfair. Shop 40% Off Rugs this April at Wayfair Find the colour, size and style that'll sweep you off your feet over at Wayfair! Shop Gifts Under £25 at Wayfair Find them something they'll love from this huge range of gifting at Wayfair. Shop 40% Off in the Children & Nursery Sale at Wayfair - Including Furniture, Bedding & Decor Check out the sale at Wayfair today and snap up a bargain! Wayfair is one of the world's largest online retailers of furniture, home furnishings, décor and accessories, including more than eight million products from over 10,000 suppliers. The company was set up by two American entrepreneurs in 2002 and was recently voted by Forbes Magazine as one of America’s most promising companies. Goods on offer are divided up into departments by furniture type and by room. There’s also an Inspiration section, and the all important ‘Sale’ page, where you’ll find all the biggest bargains. If you’ve got to fit out a new home from scratch, you’ll be pleased to hear that you can spread the costs with a Pay Monthly finance scheme in association with Barclays, as long as your Wayfair order meets the minimum price criteria. You can earn money from Wayfair by introducing your friends and family to the brand too. With Wayfair Reward Pounds, it’s win-win as you get a £10 reward with each introduction! How do I use my Wayfair discount code? Select the deal of your choice on the vouchercloud website then click through to the Wayfair website. Browse the items on offer and add what you want to your basket. When you’re ready to buy, click on the ‘Basket’ link at the top of the page and then select ‘View Bag’. Your savings will automatically be applied or you can insert your promotional code in the box and click 'Apply'. Your discount will be subtracted from your total in the order summary. Click 'Proceed to checkout' to finalise the transaction. Save up to 70% off products every day when you sign up to the email subscription. Which payment options are available at Wayfair? You can use PayPal, Visa, American Express and Barclays Finance. What do I do if I forget my Wayfair password? Simply enter your email address in the box on the FAQs section and Wayfair will reset your account and allow you to set a new password. Can I purchase a Wayfair gift card? Yes, look for the gift cards page of the website, choose an amount, delivery method, and the recipient’s details. You can add a personalised message if you want. Keep your order reference handy as you’ll be asked to quote it when you speak to an operator. You can also leave a message on the contact page enquiry form. Delivery is free on orders over £40. Wayfair delivery partners include UPS, Arrow XL and UK Mail. Wayfair has a self-service return centre that makes returning your purchase quick and easy. Simply fill out the boxes on the return centre page to retrieve info about your account. 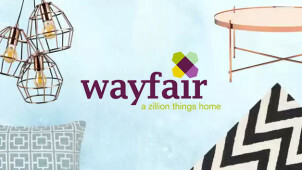 Wayfair is a giant in the online home and garden furnishings world. It stocks a vast range of furniture, rugs, kitchenware, and garden accessories, all available at the simple click of a mouse and all perfect to update your home this summer. Use your Wayfair discount code to invest in a contemporary sofa, a pair of matching bedroom tables or something to spruce up the garden now we're seeing more of the sun. There’s tonnes to inspire you on the Wayfair website, whether or not you’re an interior design enthusiast! Wayfair is so keen to help you find the right look for your home interior that it has a Pinterest-style moodboard tool, called the Ideas Board. You simply have to click on the tab at the top of the menu bar, create a new board for the room you want to decorate and then start adding items you find around the website. That way, you can see the things you like in one place and add/subtract according to your taste. Summer's here and it's time to get outdoors and enjoy the lighter evenings. We know you've been missing weekend brunch in the garden and that the kids can't wait to get outdoors either! Thankfully, hibernation period is over so you can use a Wayfair voucher code to invest in garden furniture and all that you need to help define your outdoor space. From garden dining sets to storage solutions, decorative lanterns, heaters and lighting too - there's so much on offer to help you turn your lifeless garden into a veritable eden this summer!